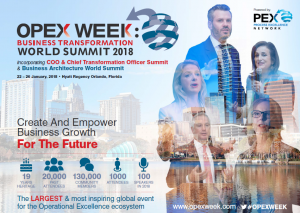 OPEX Week Business Transformation World Summit is the largest business transformation and OPEX gathering (800+ attendees), and the only one that brings together the entire decision-making unit (C-Level, OPEX, Business Architects). View the full list of the 800+ business transformation and OPEX professionals who attended the 2017 event. OPEX Week Business Transformation World Summit is the largest business transformation and OPEX gathering (1000+ senior-level executives from the leading major global corporations), and the only one that brings together the entire decision-making unit (C-Level, OPEX, Business Architects). View the full details of the 100+ SVP level practitioner speaker line up, 150+ session agenda and current sponsors in the event brochure.